NAIAS just wrapped its week-long expo. Three of our trends experts report back with what’s next in transportation. It’s an industry that boomed, declined, bottomed out, re-emerged, and now is enjoying an almost-hyperbolic kind of renaissance. The auto industry is back and it’s changed—especially as we watch the sharing economy, autonomous cars and made-in-America culture redefine the role that “auto” plays. How the North American International Auto Show itself is doing is up for debate. Some brands are opting to unveil their innovations at other shows, like the Consumer Electronics Show (CES) and private events, but interest was still high, amassing nearly 800,000 attendees. So what was exciting? Underwhelming? Three LPK trends analysts—Kevin Liu, Henri Hall and Sara Hautz—each saw it differently. Walking around NAIAS, I found myself drawn to the debut of a new generation of tiny houses. They were bigger overall, more luxurious on the inside and presented with a new name: “macro vehicles.” They demonstrate a shift from environmental consciousness—which launched a dozen recent documentaries on small-scale living—toward protectionism and lifestyle integration. For consumers to feel safer and more “at home” in their tiny houses, brands did something decidedly American: they supersized. It’s also interesting to note that these residences have crossed categories, and now identify as a mode of transportation. As the new, amped-up version of the camper, the macro vehicle empowers consumers to flee their increasingly complex lives, now filled with global ambiguity and, for some, political anxiety. Many brands featured this same trend of overbuilt, capacious styles—a departure from the compact, eco-friendly vehicles of years past. 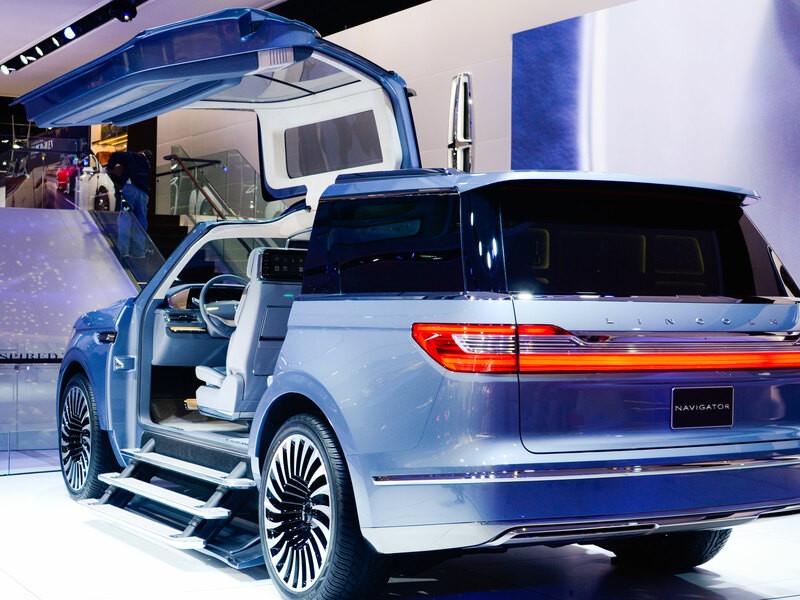 We saw it in Lincoln’s Navigator concept car and Kia’s Sorento Ski Gondola concept car. Both generated buzz for their bigger shapes, intuitively designed interiors and a host of new lifestyle features like built-in closets, shaving kits and accessory holders. Image: The 2017 Lincoln Navigator debuted at NAIAS. Across the board, new patterns in color, material and finish alluded to a collective desire to nest and seek refuge—even when we’re in the car. I saw soothing elements and luxurious touches: cool, calming colors, warm metallics, wood laminates, textured leathers and extra-soft men’s suiting fabrics. As consumers yearn for protection and safety, I wonder: how might other brands and categories foster a sense of security? Will consumers begin to view a vehicle investment like a house? We already see the two merging in 2017’s souped-up tiny houses. It could signal a new consumer trend, in which shoppers become emotionally attached to cars, viewing them as large consumer durables that last for many years, and perhaps serve many generations. 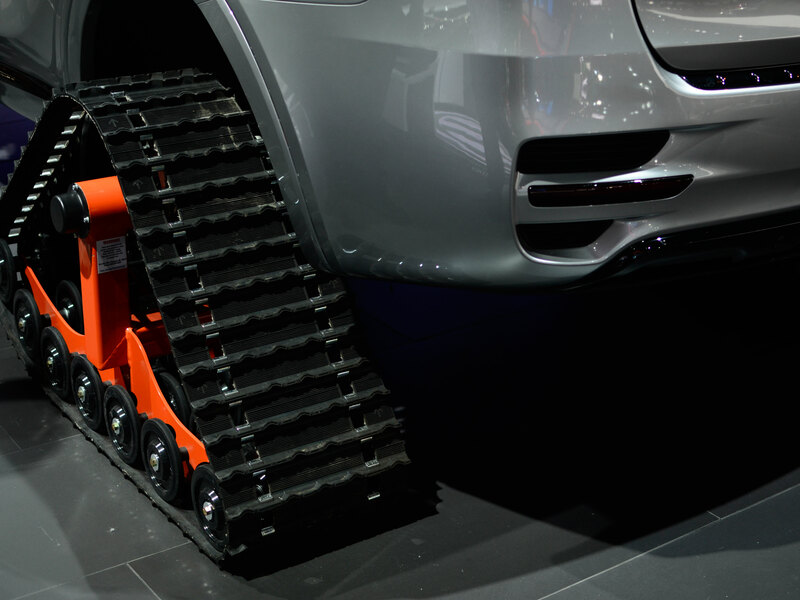 Image: The urge to flee: the Kia Sorento Ski Gondola concept car’s tires cater to the consumer want to go anywhere. With a growing list of companies investing in driverless technology, much of the buzz from NAIAS circled around the future of autonomous vehicles and transportation. At the show, I saw automakers aplenty positioning themselves as key participants in the autonomous future. It’s not about buying a car, it’s about ordering one. First up: Ford. 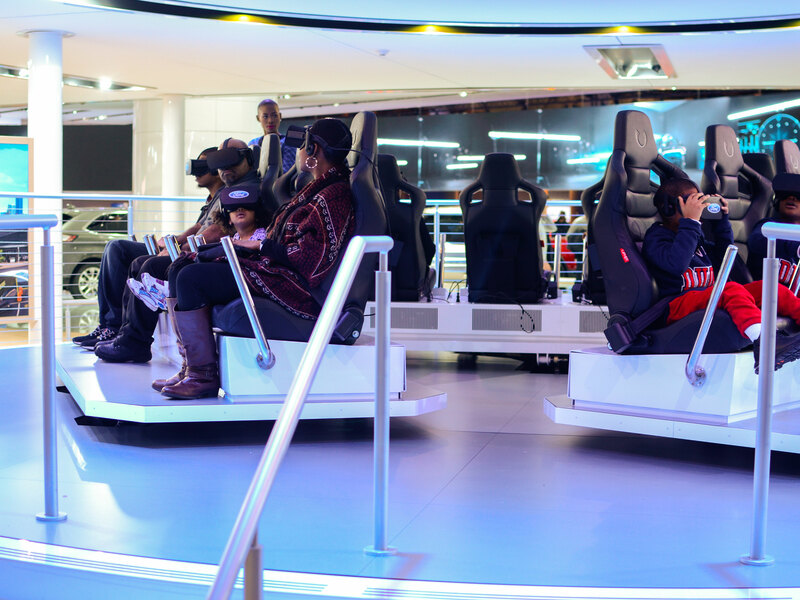 The American auto giant showed off interactive installations and activities promoting its specific vision for the future of mobility. Through VR headsets, the brand guided attendees through a “smart” city of tomorrow, where vehicle ownership was replaced with a series of transportation services. It’s a world where simple, fluid communication exchanges between the vehicle, passengers, pedestrians and infrastructure in unison, all via smartphones. Volkswagen’s I.D. Buzz concept car hit on similar themes, but with a more obvious nod to Millennial and Gen-Z consumers. In this car, innovative technology hinges on deep learning algorithms and personal sensors—meaning the passenger’s preferences are embedded and understood before they even step in. Their favorite song is playing, their preferred temperature is set and their route is known. I left the show quite impressed with Ford and VW, and humming with lots of questions: if we start requesting cars with our phones, what are the cost and efficiency implications on on-demand delivery of goods and services, like UberEATS? Furthermore, how might brands keep up with this industry by providing convenient, easy-to-use services that will replace our soon-to-be-obsolete model of ownership? Image: Wearing VR headsets, people get lost in Ford’s futuristic world. Despite high attendance and the unveiling of sleek new concepts and intuitive technologies (well-documented by Kevin and Henri), NAIAS was largely a showroom of updated production models. I get its appeal for today’s auto consumer and traditional car lovers—but it left me wanting more. With automakers like Fiat Chrysler unveiling concepts at CES instead of NAIAS, and others like Rolls-Royce and Lamborghini skipping it altogether, it’s clear that boundaries between the tech and auto industries are blurring. It’s reflective of a shifting paradigm for auto shows—one that NAIAS must address in the future if it hopes to grow and attract tomorrow’s consumer set. Though NAIAS attempted to connect to the technological future—particularly through the addition of AutoMobili-D, an exhibit highlighting new mobility technologies—the show feels overly focused on aesthetics and specifications. These are the bells and whistles beloved by the traditional car enthusiast—but if tech is a dominant purchasing factor for consumers, shouldn’t it be highlighted in the same way that engine cylinders and aesthetic details are? It’s understandable that some companies with futuristic technologies are opting to show at CES, where tech innovation is the focus and arguably more appreciated, but that doesn’t mean NAIAS should remain a show rooted in traditional car show appeal. As industry boundaries blur, trade shows face an uncertain future. How can they strike a balance between relevance and differentiation? What does this mean for brands? Will Chevrolet or GM become information-technology companies? The future is, as always, uncertain—but I’ve got some ideas. So what can all of this mean for your brand? To start a deeper conversation about industry trends and innovating for the future, contact us. Kevin Liu is a trends analyst at LPK, where he lends his strategy and business background to make brands hip again. Outside the office, Kevin is a fitness enthusiast and spends way too much time on the internet, obsessing over meme culture. Find him at kevin.liu@lpk.com and @itskevinliu. Henri Hall is a trends analyst at LPK, as well as a student of industrial design at the University of Cincinnati College of Design, Architecture, Art, and Planning (DAAP). With a background in anthropology, he combines the scientific method with his creative skills to develop innovative solutions. Henri is also an aspiring polyglot and passionate follower of linguistic trends. Connect with him at henri.hall@lpk.com. Sara Hautz is a trends analyst at LPK, possessing a blended background in fashion design and business that informs her unique strategist-meets-creative POV. A self-described information sponge, Sara has an insatiable appetite for learning that fuels her love for trends, music, traveling and reading. Reach out to talk trends and music recos at sara.hautz@lpk.com.